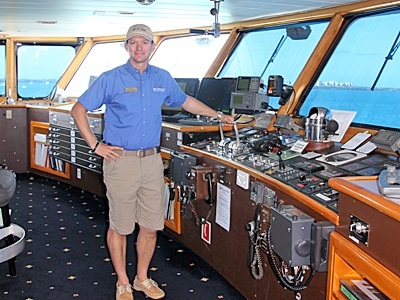 Captain Barrett Whitten at the helm of the Safari Endeavour. ABOARD THE SAFARI ENDEAVOUR—I had mixed feelings when the skyline of La Paz came into view this morning. It meant that our cruise in the isolated reaches of the Sea of Cortez was over, and we had one more day and night on board. It’s so easy to become attached to members of the crew—a wonderful group of talented and caring young people—and to new friends from far-flung places that we’d probably never see again. And our cozy cabin had become a comfortable home away from home. But—and this was a big BUT—it also meant that today we’d be going back out of the harbor to look for whale sharks. This was why I’d booked our cruise when I did, because November is when these behemoths frequent the Sea of Cortez. 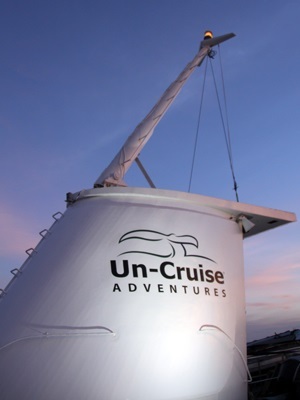 Un-Cruise contracts with a local company to take guests out on small cabin cruisers with heads, comfortable seats, a shaded area, refreshments, and swim decks with ladders to facilitate getting in and out of the water. The boat captains and crew are experienced in spotting whale sharks and interacting with them. Though the sun was shining, the seas were still rough from the weather front that nixed our sea lion encounter yesterday, so I had low expectations. When we reached open water, the swells became more impressive, and my spirits were sinking fast. How could anyone spot a whale shark beneath the surface in these conditions? I’d done my research, and learned that whale sharks are the largest fish in the world, reaching lengths of more than 40 feet and weights of nearly 50,000 pounds. Because of their size, they can be mistaken for whales, but they are fish–with gills–and don’t need to surface to breathe, as whales do. Best of all, they are gentle creatures that feed on tiny plankton, and are tolerant of humans as long as they are not harassed. We were under strict orders not to touch them, and to stay clear of their tails, which sweep from side to side to propel them through the water just beneath the surface. 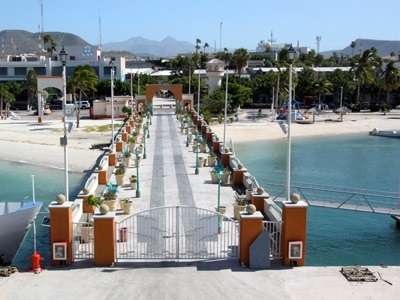 The dock at La Paz leads to a wonderful, statuary-lined malecon where locals gather at all times of day. We all duck-walked quickly to the swim deck and plunged in. As I cleared my snorkel and stuck my mask into the water, I saw the open mouth of a twenty-footer heading my way. Its maw was at least three feet wide and cavernous—designed to filter plankton and small fish from the water. I back-pedaled a bit to avoid a collision, and watched, enthralled, as the bus-sized creature slid by me, its tail moving languidly. Its back and sides were beautifully marked with rows of white spots and pale stripes, and I saw a flash of a white belly. Its eyes were small for its size, and set on the sides of its broad head. I was in its line of vision, and wondered fleeting what it thought of my intrusion into its realm. In a few seconds, a second whale shark appeared and the two began circling lazily, apparently enjoying their lunch and unconcerned about our presence. I guess we were no more bother than the remoras hitching a ride on their fins. There is something ethereal about being in the water so close to such big animals—wild animals, mind you, who easily could crush us if they chose to. But they don’t. In light of the fact that Japan plans to slaughter more than 330 protected minke whales in the coming months for “research,” it makes me wonder which is the higher life form. After treading water in the cresting waves for a while, we took turns grabbing the boat’s heaving ladder and clambering back aboard. No sooner were we seated than the shout came again, “Into the water, now!” and we were once again within touching distance of one whale shark, then another. This scenario was repeated twice more, until we had interacted with six whale sharks, most of them 20 to 30 feet long. They can live to be 100, so I’m guessing these were probably half that age, which was still stunning. Saying goodbye to a familiar sight on the Safari Endeavour as the light faded on on our last night aboard. We were all back on board ready to head back to La Paz, when I looked over the side and into the eyes of a juvenile whale shark eight to 10 feet long. The captain quickly cut the engine and we watched as the curious youngster quietly inspected us before continuing to feed. The other groups who went out also got to interact with whale sharks, so there was much celebration that evening during cocktails in the lounge, and over an excellent dinner of beef tenderloin and Baja lobster tail. In the lounge after dinner, we enjoyed a wonderful slide show compiled by the crew of our Un-Cruise Experience in the Sea of Cortez. Tomorrow morning after breakfast our hard-working crew members will be lined up on the dock, just as they were six days ago, to bid each of us farewell. But this time we will know each of them by name and have shared wonderful experiences with them, so there will be many hugs and tearful goodbyes before we board buses for the ride back to the airport (or Barcelo Resort) in San Jose del Cabo. Thank you so much for this link. I just got around to reading and checking out your whole blog. This is so nice for us all to have! Truly appreciate it.! Day 5: We searched for whales, but for naught…maybe tomorrow!